The London 2012 Olympic torch relay sets off in May and the BBC will be following it throughout its journey. The Olympic flame arrives at RNAS Culdrose, in Cornwall, on Friday 18 May and begins a 70-day relay round the UK the following day. The BBC will have continuous video coverage, as well as providing comprehensive route and local information, so you can catch the relay when it comes near you. Here are some frequently asked questions, so you can get the best out of our online experience. How can I watch the torch relay online? The Olympic torch relay begins its 8,000-mile journey around the UK on 19 May and reaches the Olympic Stadium in London on 27 July. When the relay gets under way, a video player will appear at the top of the page for the current day. So, for example, if you are on 19 May page, you will see video as-it-happens on 19 May, and so on. If you navigate to a future day i.e. a day that hasn't happened yet, video will not be available. Most torch relay days run for 12-14 hours and comprise a morning and afternoon session. By clicking the Play icon on the player, you should see the current live session. Both UK audiences and users outside the UK should be able to watch the continuous video stream on the current day. We have introduced a delay of up to two minutes on our video to help deliver a smoother picture for you to watch. This is why we're not referring to our video as "continuous" rather than "live". Why can't I see the video stream on my device? Currently, continuous video is only accessible to users on desktop and laptop computers and on hand-held devices running the Android operating system. The latter is available in the UK only. However, you will be able to see plenty of other online content for each day, including day schedules, weather and day information. We aim to implement video coverage for iPhone (iOS) at some point during the relay. How can I find out when the torch relay comes near me? If you are using a desktop computer or laptop, there are two ways to find the nearest torch route to you. The first way is to use the "Find the torch near you" box on the right of the page. Just enter your town or postcode and results will show the five closest routes to the location you entered. By clicking on any of these search results, you'll be taken to the page showing the route for that day. 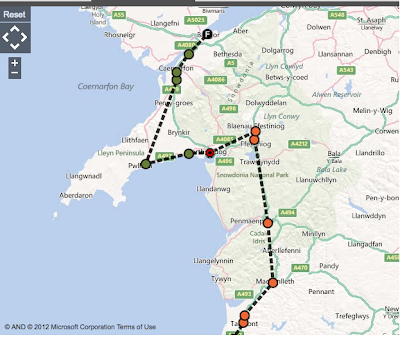 The second way to find the nearest route is to click on the "All routes" tab above the map. This will show you a map of the UK with all the routes for the 70 days. Click on one of the routes to go through to that page. If you're on a mobile device, enter your town or postcode in the "Find the torch near you" box and the five closest routes to the location you entered will appear in the search results. By clicking on any of these search results, you'll be taken to the page showing the route for that day. Or click on the "Full 70 days schedule" label and select the route nearest to you. How can I find out where the torch relay will be on a certain day? As well as location, you can search for relay routes by date. If you are using a desktop computer or laptop, just use the horizontal navigation bar near the top of the page. Use the arrows on the left and right to scroll through the dates and click to go through to the relevant page. The map should show you which towns and stops are on that day's route, and the estimated arrival times for each stop can be seen below the map. If you are on a mobile device, the calendar label at the top of the page and select to go through to the relevant page. How can I find out whether the torch relay goes down my street or past my home? Once you have selected a day route, you can check our "Street by street" information. If you are using a desktop computer or laptop, just click on the "Street by street" tab above the map to see a detailed breakdown of road names and arrival times for that day's route. If you are using a mobile, just click on the "Street by street" label to see a detailed breakdown of road names and arrival times for that day's route. How do I find out what time the torch relay will visit my town, city or street? See the answers to the two questions above. Find out whether the torch comes to your town, city or street by using the "Find the torch near you" function. If it does come to your city, town or street, you can check the estimated arrival times and "Street by street" information on that day's route. On the map, the dotted lines between stops are straight and don't follow road contours. Why? The dotted lines on the map are an approximate route to give you an idea of the general order of stops on the route and the direction of travel. The actual relay route will follow road contours. Why is the big red flashing torch location tracker nowhere near the dotted route line? As mentioned in the previous answer, the dotted line simply shows a general order of stops on the route. The red flashing torch location tracker will give the closest exact location we can ascertain at any given time. Therefore, the red flashing tracker may appear off-course by deviating from the dotted line, but is in fact the best indication of where the torch currently is. The red locator only appears on 'live' days, not past or future day routes. I want to go to see the torch relay live, how can I check weather and travel information? Local weather information is available for up to three days ahead of the current day. So if it was the morning of the 19 May, you should be able to see local weather information for all the relay stops until 22 May. If you are on a desktop computer or laptop, you should be able to see local maximum/minimum temperatures and weather forecasts by hovering over route stops on the map. You can also click on the weather icon to go through to more detailed weather information on the BBC Weather site. If you are on a mobile phone, just open the day schedule to see local maximum/minimum temperatures and weather forecasts next to each stop. Local traffic/travel information, including planned road closures, is available on the current live day. Why does weather information appear on some days and not on others? As mentioned in the previous answer, weather information is only available for three days into the future. If you are looking at a past day, for example the current day is 27 May and you are looking at the route for 25 May, then no weather information will be available. If you are looking at a future day route, more than three days ahead of the current day, then no weather information will be available. How do I know about any local activities on a particular torch relay day? When the torch relay starts, there will be a 'Things to do' module on the site. This will display local activities from free test sport events to cultural events taking place in the region where the torch is going. Clicking on any of these activities will take you to the Things to do site and give you more information about that event. You can find out more about the torch relay and how it started at this "What is the torch relay?" guide. When the torch relay begins, we will be showing live text commentary alongside the video. You will have the opportunity to text message, tweet or send a comment via Facebook.